They say that everyone you meet in this life is for a reason. The longer you spend time with the person, the stronger is the karmic reason. Of course, in today’s fast-paced world, where we don’t have a minute to analyze our own existence— – who has the time to go probing the reasons for the presence of others in their lives? Unless…. I knew who Rahul was before I met him. A green-eyed, blue-blooded young man boasting of a palatial house in the heart of Pune city, and my wife’s good friend during her college days. He had all the things that any normal middle-class aspirant ought to feel envious about. My first face-to-face rendezvous with Rahul was inconsequential. It was the mid-nineties; I was a struggling entrepreneur. After a long week of work, I had taken my wife and our baby girl out for dinner. He, in his unchanged tennis gear, had landed up at the same restaurant in his luxury car. We were from different planets—my sweat was from a scooter ride in the suffocating Pune traffic, his from a game of tennis. A few years rolled by, Cybage was more settled now—at least settled enough to have a sense of pride in flashing business cards with the “CEO” title. The social ladder had elevated to a level where a few of my newer friends had intersecting circles with the likes of Rahul. During one such social dinner, I was formally introduced to Rahul. They say that if you don’t know someone, the safest way to break the ice is by talking about politics. Well, my strategy accomplished more than breaking the ice, it actually opened the flood gates. All of Rahul’s frustrations came pouring out like a tidal wave—his disillusionment with our country’s political fabric, his intolerance for corruption, his desire to bring about changes…. How convenient, I mused. So easy for a person born with a silver spoon in his mouth to evangelize on the needs of his hand-to-mouth countrymen over a social drink! A few more years rolled by, I continued running into Rahul occasionally over formal get-togethers. Then something interesting transpired. Once we both got invited as guest speakers for an event that revolved around entrepreneurship. Cybage’s ‘wonder years’ story was elegantly chronicled in my first speaking slot. Then it was Rahul’s turn. He kept it simple. He chose not to showcase any personal success story. Instead, he just took over my narration as a case study and moved on to directly mapping it with the qualities of an entrepreneur! Success stories of others gave Rahul an adrenalin rush. He would learn from them, and then would diffuse this wisdom at leading management campuses where he was invited as a visiting speaker. 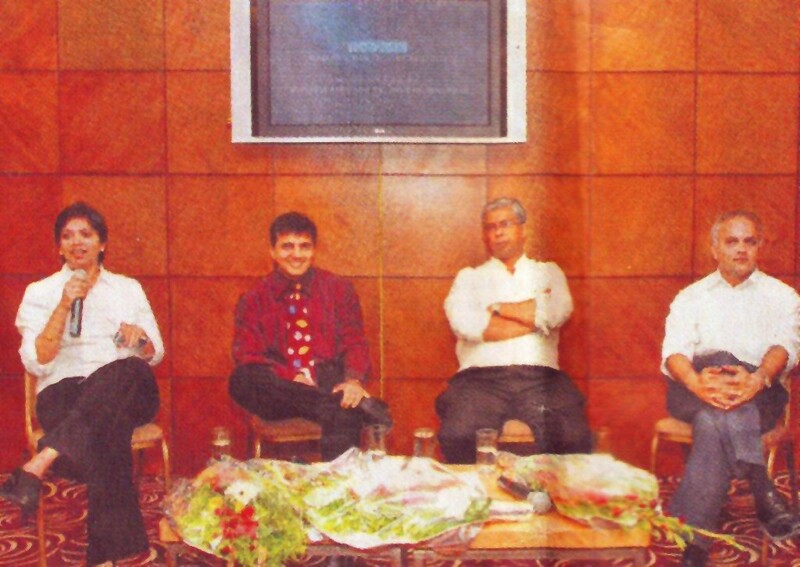 Rahul ran his own VC outfit, IndiaCo , in a remarkably different flavor than regular VC organizations. Apart from funding startups, IndiaCo dedicated a lot of its time in mentoring and guiding beginners. He even persuaded me to conduct personalized workshops for a group of ten budding female entrepreneurs shortlisted by the ISB management institute. Clearly, my prejudices had bitten the dust. I realized my bigotry of being judgmental of those who deliver righteous commentaries on lower society disparities over higher society dinners. Rahul now had graduated to the “buddy” category. We had many family friends in common, and I was educated about Rahul’s passion for music. So, once we invited Rahul and Monali home for dinner followed by karaoke, only to discover that his musical passion was not exactly the karaoke type . Apparently, musicians who practice classical singing from the age of fourteen can’t relate to ‘filmy’ music! Of course, the masses believe that “a talent is a talent” only when there is an audience for the performance. ‘I don’t sing for the audience, I sing for myself’, Rahul explained. I didn’t get it. Later that same night when my kids swept him off with their karaoke melodies, he urged us to enroll them for classical singing classes. ‘It will teach them to train their voices’, he said. This part, I got it. Next, our kids started having a new weekend visitor at home. Rahul’s ‘singing’ Guruji of the Patiala Gharana . Results were quick to come—within a year, both kids excelled in multiple musical events, both in and out of school. Then, about a year back, the kids gave up their singing classes. Misha’s board-exams, Aneesh’s solidarity with his sister, and parental complacency—all played equal parts in dispersing off the musical spell. Rahul’s delightful spell, however, continued—From peace marches for Anna Hazare and mentoring of promising entrepreneurs from the less-privileged India to the relentless pursuit of his musical passion. Every time he would run into us, he would make it a point to express his disappointment for letting our kids off the hook on the singing front. It appears, on June 30, 2012, we were in his thoughts again. After his singing class, he sent a message indicating that he had informed Guruji that the kids would be starting their lessons again, and that we should take it further with him. Later, that same night, Rahul went to bed almost like any other previous night of his forty one years in this world. With one difference, he decided to wake up in some other world. It has been almost four months since Rahul moved on. The life in Rahul’s outer social circles has also moved on, with some minor geographical realignments. For instance, Guruji’s travels now have a different trajectory on Sunday mornings. Our daughter Misha (along with her mom this time) restarted her second stint at classical singing about two months back. The show goes on. However, something is amiss here. Shouldn’t there be an applause between performances? But for a theatre to applaud, the meaning of the artist’s performance needs to be clearly understood. And that meaning, in turn, depends on sensing what is going on in the artist’s mind. So about a month back, I took the plunge in this mystical ocean with Rahul’s Guruji to better understand the sound of music. And something very unusual has happened that I would like to share here. You see, for years I have been having this internal struggle, an idiosyncrasy that many successful people are a victim of… I THINK nonstop at a furious pace, sometimes I feel my wandering mind never gets a break. But startlingly, now while I am singing, for those brief moments my mind no longer wanders! It’s like meditation, only more melodious. There are no disturbances, only peace. No thoughts about anything or anyone. Not even of the one who is responsible for this trigger! Strangely, that ‘calm’ state has brought me closer to Rahul. It’s like he is not in my thoughts, but more in my thoughtlessness. It’s like we are finally from the same planet, while ironically he has moved onto a different planet. It’s like he gave a parting gift not before leaving, but after leaving. Wonderful choice of words and tone Sir ! Very thought provoking article. Currently we live as if we are never going to die and then die as if we had never ever lived. We never know when our exit has been planned. So we should take some time out of our “busy” schedule and spend time to analyze the purpose of our existence. Like all the other articles that you have written, this one also compels to take a break and think.. Extremely grasping..
great that you have discovered music … it is a wonderful passion. Talent is something that exist in hidden state and it requires to be unveiled. Just like the Kundalini needs to be awaken talent too requires to be awaken and once it rises it takes us in the world of calmness and serenity. Nicely put into words sir.Your choice of words and relating things is marvelous. Very touching story. Yes, I too believe it needs a breakthrough event or someone to awaken us from our day today world of illusions, which we think and live as reality forever whereas the truth is that “Change is the only constant thing”. Hence such endeavors like music or meditation for connection or appointment with self gives the power to one to sustain the change and yet be happy. Very beautifully put across Arun. The concepts of mental silence and thoughtlessness are something that few people experience. May you have many more such sojourns ahead.